In search of the best Oxtail on the island, I've tried three restaurants so far. Ton Ton Ramen in Waipahu has still won my heart! Their tender, melt-in-your-mouth oxtail meat and delicious clear broth is still the best on the island. I rate the Oxtail Soup based on how easily the meat falls off the bone. 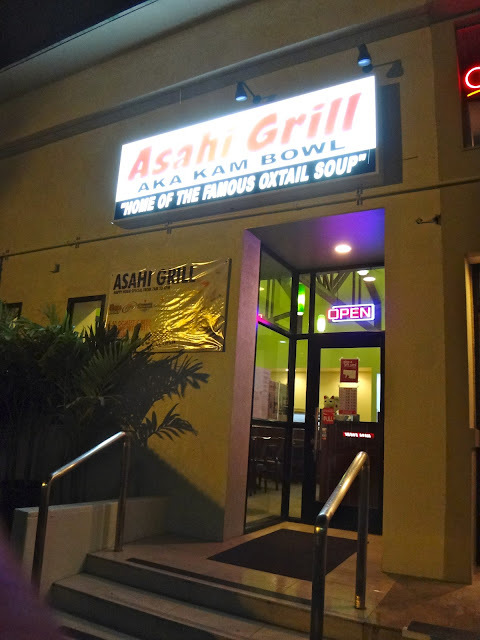 At Asahi Grill (located next to Yogurstory), I constantly had to pull and tug at their meat. By the end of the meal, I was just so frustrated with having to continually tear the meat off, that I did not enjoy it. I looked at the bones that I tossed in the bowl and there was still so much meat on them, but I was just over it. Now, this Oxtail Soup is supposed to famous! This is the Kapiolani Coffee Shop's recipe! But, in the end, I was not impressed. All I remember is the crunchy, tough cartilage that was not appetizing. Thank God we ordered their Soft Shell Crab Salad as well! Man, that saved me!!! Not often you find Soft Shell Crab in casual restaurants like this, so I wanted to see how good it was here at Asahi. The crab was crunchy and the salad was fresh with a really tasty oriental dressing- their house Asahi dressing. Well worth the $12 salad. This is a must-try. BF had their Miso Butterfish, and I assume it was good. He left not a bit of rice on the plate! Next up on the Oxtail Soup Search? Aiea Bowl! But, if you're craving Oxtail Soup NOW, I highly recommend Ton Ton in Waipahu or Sunrise Restaurant in Kapahulu. Those are my favorites!